THE MODERATOR: We are pleased to be joined by Clemson head coach Dabo Swinney, offensive player of the game Trevor Lawrence and defensive player of the game Trayvon Mullen. We’ll start with an opening statement. DABO SWINNEY: Okay, good morning. What a quick night we had, but what a fun night, celebrating with our team and our families, fans and friends, celebrating just an incredibly special, special accomplishment by this team. So proud of our guys, proud of these two guys, and just, again, as I said last night, just so happy that we have the opportunity and the blessing to experience such a great moment. Kind of unique, today is January the 8th, and we’re here in obviously the San Francisco Bay Area, and it’s Dwight Clark’s birthday. Dwight Clark was a Clemson Tiger, and I just think it’s pretty neat that we’re here this morning as the national champions here and just got to think that he’s smiling down on us. Hope everybody has enjoyed your time here, and we appreciate all the CFP folks for all their great efforts in making this an awesome experience for everyone. Q. Dabo, among your peer programs, it’s pretty unique that you’ve been able to keep your staff largely together during this run. How do you think that’s helped you in preparing for performances like you had last night, and just how difficult is that to actually pull off when you have success, guys have opportunities to leave? DABO SWINNEY: Well, I mean, it really hasn’t been that difficult. I think it’s — I mean, it’s not something that I really worry about. We just — we have a great environment to live in, a great environment to come and work in. We have great relationships. Our staff is very close. We’re very — you hear about Clemson family all the time, but it’s a very real thing for us, and I think that — I mean, we have guys that have opportunities to leave every year, and we’ve had change, I mean, since I’ve been the head coach. I’ve had different coordinators and different position coaches, but when we’ve had change, we’ve been able to make good decisions on who gets the opportunity to come in and be a part of our program. But certainly continuity has been a great thing, and I’m thankful for that. Got a bunch of great, committed people and go people, and I always say, I hire good people first, coaches second. And again, we’re just fortunate that we’re at a place like Clemson where our families enjoy living. We have the opportunity to compete at the highest level, live in an incredible place, recruit at the highest level, and when this is your profession, that’s pretty special. You know, when guys have had opportunities to leave, back in ’14, my offensive coordinator Chad Morris had an opportunity to go be a head coach, and it was great opportunity for him and created an opportunity to promote some guys on my staff that I felt like were ready and had done a good job and earned it. I had a change at defensive coordinator back in ’12 and Brent has been with me ever since, Dan Brooks and Marion Hobby retired in — Marion went to the Jags after we won it in ’16 and Dan retired. I was able to hire Todd Bates and Lemanski Hall and Mickey Conn, as well. So we’ve had some change, but I’ve had a lot of continuity from our support staff and guys that I felt like had opportunities to move up. Q. Just throwing this out there, if you’re looking for someone to write your book, I’m available. When we turn this book into a movie, who would you choose to play you? Who would you choose to play Kathleen, and who would play Trevor and Trayvon? DABO SWINNEY: Oh, man. Well, I mean, Matthew McConaughey, of course. Have you seen my abs? Just start right there. Drop the mic. Kathleen? Oh, boy. Y’all help me out with this one. Katie Holmes maybe? You got any great suggestions right there? Who’s the queen in England? What’s her name? One of the — not the queen. DABO SWINNEY: Yeah, Kate Middleton, yeah, we’ll bring her in. And Trevor, I just think we just bring back Sunshine. He’s still kicking somewhere. We’ll bring him back. I don’t know, Trayvon, who are we going to go with you? DABO SWINNEY: Your brother? How about we bring Lamar Jackson, which is his first cousin, Lamar’s mom and his mom are sisters, so we’ll just bring Lamar in to play Trayvon. That would be great. Q. Trevor, I was watching you on the field last night, people were trying to interview you and get sound quotes, and you were just watching the fireworks, and it looked like you were just taking it all in. What was going through your mind at that moment and you were just looking up in the sky? TREVOR LAWRENCE: Just kind of thinking back, the journey, like Coach Swinney always talks about, how that experience is awesome, but really when that experience happens, you think about how you got there and just my teammates and everyone involved and just kind of thinking back on everything and taking it all in. Q. Dabo, in sports you see people who have confidence and there’s elite confidence, then there’s probably a level of confidence we could call, we can beat Alabama by four touchdowns confidence. I was wondering, does it take a program years to think of itself that way? What’s that path like? DABO SWINNEY: Oh, that would probably be crazy confidence. I don’t think that we went into the game thinking we were going to beat Alabama by four touchdowns. It just kind of went that way. It was our night, and we got control of the game, and sometimes when — I’ve been on both sides of it. Sometimes when you get momentum rolling like we were able to get it and just the energy all channelled in the right direction, it can kind of be insurmountable, and that’s what happened last night. I mean, it was just kind of an overwhelming collective effort by our group. But I think to — first and foremost, you don’t make it about Alabama. You know, I think that that’s — I’ve been at Alabama. I spent 13 years there, so I can’t tell you, there was a lot of times as a player I walked off the field and I wasn’t sure that we were better than that team, but they thought we were better, and we won a lot of games when we got off the bus. I think for our program, it’s something that’s been important to me from day one is to make it about us. It’s not about the opponent, and it’s not a disrespect to any opponent, but we really — we try to treat everyone the same. I mean, we don’t practice any different for Alabama than we do for Furman, and that’s not — that’s certainly not a disrespect, it’s just that’s what we do, and that’s exactly what Coach Saban at Alabama does, too. I can tell you that right now. He focuses on his team. And I think any championship-level program, that’s the mindset that you have to have, because — and that was when I first got the job, that was one of the things I told our guys back in ’09 was listen, we can’t — we’ve got to lock in on the things that we control. You have to win in your mind first. To do that, you have to have a routine that you believe in, and every game is the biggest game, and you play to a winning performance. It shouldn’t matter who you play. Oh, well, this week we’re playing Florida State so let’s really practice hard. Let’s meet really with some intention and purpose. We just don’t look at it that way. So you certainly know that there’s some — some of these games the margin for error is much smaller. I told them last night it’s going to be a few plays. But we just try to keep it all about Clemson, prepare to a standard, and that’s allowed us to have a lot of consistency. Q. Dabo, you’ve been doing this now 11 years on this run you guys are on. Is it fair to say that you guys can call this a dynasty and that you’re at a different level now than most of the other teams in college football? DABO SWINNEY: No, we’re a long way from a dynasty. We’re a great program. We’re a great program. There’s no doubt about that. We’re incredibly consistent in every area of our program. I mean, and that’s what I’m more proud of than anything is just the consistency, and one of the things we talked about this week, over the last decade, everything we’ve done once, we’ve done multiple times, and it’s kind of been a progression. We won our first division in ’09, well, we’ve won seven now. At that point we had not won a division, and then we come back in ’11 and we won the league. We hadn’t won the league since like 1991. Now we’ve won it five times. We won 10 games in ’11. That was the first time since ’90 or ’91. Now it’s been eight years. We got to a BCS in ’11 and ’13. I told them they lit up the Empire State Building once, and now they’ve done it again. So the only thing we hadn’t done again was win it all. It’s just been kind of a progression for us. We’ve just kind of kept our head down over the last decade and gone about our business. We’re certainly — I think we’re as good a program as there is out there, but we’re a long way from a dynasty. I think from a dynasty standpoint, Alabama is kind of in a category of their own. I mean, Coach Saban may have won five National Championships in 10 years, or however long he’s been there. It’s incredible the run that they’ve had. But we’re just thankful that we got the opportunity to experience it. But to be able to win two out of the last three, I think that certainly puts us in a place that’s pretty special from a program standpoint. Q. A couple of us ran into an NFL GM last night and casually asked him what he thought of Trevor, and he said, I don’t have to know about him right now because obviously he can’t draft him. How often do you recruit to that three-year standard for any of your players, tell him you can be in the league in three years, and can Trevor play in the NFL right now? DABO SWINNEY: Oh, I don’t recruit anybody to that. I think for me to — I mean, I’m not God. God has got the plan for their lives. What I recruit them to is the opportunity that they have to come be a part of our program and the resources that they’re going to have a chance to tap into, the development that they’re going to be afforded academically, athletically, just career wise, you name it, the experience that they’re going to have. That’s what I talk about. If it’s in God’s plan for — if it’s God’s plan for them to go play in the NFL, well, hey, that’s going to happen, three years, four years, five years. I have no idea. I just talk about they’re going to be better if they come in and they put their head down and they go to work. I don’t promise anybody anything. These guys will tell you that. I recruit everybody the same. You come in, you go to work, you get in line and you buy in, you’re going to be better because of it. But again, the NFL stuff, that’s not something that I spend hardly any time talking about it until it comes time for some of these guys to have to make decisions, and I try to help them have good and accurate information so they can make solid decisions for their future. Q. Could he play in the NFL right now? DABO SWINNEY: Oh, we’ve got a bunch of guys that could play in the NFL. Give me about six months, I could probably get a series or two in. I’d be ready. Q. Coach, you said a couple weeks ago that you wouldn’t consider Alabama your rival until you beat them at least one more time. Is it safe to say that you can consider them a rival now, and also, you had some guys step up in this playoff, Albert Huggins, of course, last night, Nyles Pinckney made the big tackle on the fake field goal. Has this been kind of a theme with this team all season going all the way back to Chase Brice maybe even more so than any team you’ve ever had? DABO SWINNEY: Yeah, next man up. I mean, Trayvon, he went down last night, Mark Fields went in, and he made two unbelievable plays. Next man up. I tell these guys all the time, you’ve got to be ready, you’ve got to be ready, and as far as a rival with Alabama, I would say they probably — I think it was all kind of nice and sweet back in ’15, but they’re probably off a lot of people’s Christmas card lists now back home. But it’s more like maybe brothers, kind of a sibling rivalry, if you will. You know, listen, I have so much respect for Alabama. I mean, Alabama is home, it will always be a place that I love, and I’ve got a lot of family, and I look at it the same at Clemson. It’s home, it’s family. It’s a very healthy rivalry. I think there’s a lot of respect. I’ve got — it’s going to take me like two weeks to respond to my text messages because it’s like a double-up game for me. Usually I always get a lot of well wishes before or after games from all my Clemson family and friends, but then you play Alabama, and it’s doubled because I’ve got Alabama family and friends. It’s a lot of fun to compete against the University of Alabama. Probably a little bit more now, little brother has kind of grown up a little bit, and we’re a little bit more competitive. Now we’ve kind of won the rubber match, if you will, in the Nattys. It’s 2-2 overall, and I told Coach Saban last night, he was very gracious after the game, and I just told him, I said, see you next year, because I don’t think they’re going to go anywhere. They’ll be back. Q. It’s way early to be worrying about the NFL Draft, but building on the other question, are there any expectations about what last night’s game is going to do for any of your players looking to play in the pros, and on the flipside, for Alabama? DABO SWINNEY: Yeah, well, I think it’s certainly going to enhance a lot of those guys’ opportunities because you’re playing against the best. I mean, there’s tons of guys on that field that are NFL players and talent, and so it gives all those scouts and folks the opportunity to get another level of evaluation to see how a lot of our guys performed, certainly see Christian Wilkins and some of these seniors, even a guy like Mark Fields, who hasn’t had quite as much opportunity, but he’s going to test well, and to see him go in there and play the tight coverage that he played, it’s a great opportunity, another level of evaluation for all of them. But at the end of the day, one game I don’t think will make you or break you. It’s really your whole body of work. I think we’ve got a lot of guys that will get a bunch of opportunity. I’ve got hopefully a couple more guys that the Senior Bowl may invite, you know, kind of fight to get some of our guys in there every year that I think should be in there, but hopefully they’ll reach out and give a couple more of my guys a chance to get in there after they performed against those guys last night the way they did. DABO SWINNEY: Well, I mean, I think that speaks for itself. Those guys, they crank them out every year, draft picks. Just kind of another year for them for sure. They’ve got a bunch of NFL players on that roster, and that’s kind of the way it’s been since Coach Saban has been there. Q. For both of the players, since it’s not a dynasty in your coach’s eyes, can you both help put into perspective what you feel like you’ve been a part of accomplishing at Clemson? TRAYVON MULLEN: First, I feel like this program is based off of love as far as with the players. But also the sense of love for each other. We care about each other, and I feel like every Saturday we go out there and show it. We always preach that as far as with the coaches and the players. We love each other, we go into Saturdays, we love our fans, the culture, just everything about the program. TREVOR LAWRENCE: Obviously he can attest to it more than me because he’s been here longer. I’ve only been here for a year. But just in my first year, it’s just been amazing, definitely made the right choice coming to Clemson, and then kind of like Christian and Cle said last night, anyone out there that has any doubt about Clemson and what they say, it’s all true. Just real family, and the way we play for each other, the way these coaches love the players and just everyone is special. Q. Dabo, you and Nick obviously different personality-wise; how are you different in the way maybe you built your program and you run your program? DABO SWINNEY: You know, I’ve never been in his program, so I really — I’ve not been inside his walls. I’ve never been in his staff meetings, so I can’t really answer that with a lot of knowledge. All I can say is I think that we’re both true to who we are. Coach Saban believes in who he is and how he does things. I believe in who I am and how I do things. And although that may be different, we may have a different approach, day-to-day approach in maybe how we run our programs. I think that we both have had a level of consistency because we believe and are convicted to our core values, and it just shows that there’s lots of different ways to do things. For us, we’re very detailed. I would say that there’s some similarities to our programs. We’re both probably — I know we’re detailed. I love my guys, and I love what I do, but these guys will be the first to tell you, I’m a no-nonsense guy when it comes time to work. I want to be about our business. I don’t like wasting time. I believe in being very efficient with our practices and how I manage the staff and how I manage the practice schedule and so forth and just how we run our calendar and the discipline in our program. It’s very clear. There’s no gray area. I think that you know where you stand with Coach Saban, and I think our guys know where they stand with me. So there’s I’m sure a lot of similarities, but I can’t — having never worked for him, I can’t really — all I know is what I know and what I do and what I believe in. But I do think, too, we both have built a great infrastructure and support staff that’s been incredibly beneficial to our players and their development. So that’s probably it. Q. Trevor, if you can recall at 9:00 a.m. Tuesday a year ago, what class you would have been in and who your teacher was? And just following up on that, does 12 months ago seem like 12 months or a lot longer? 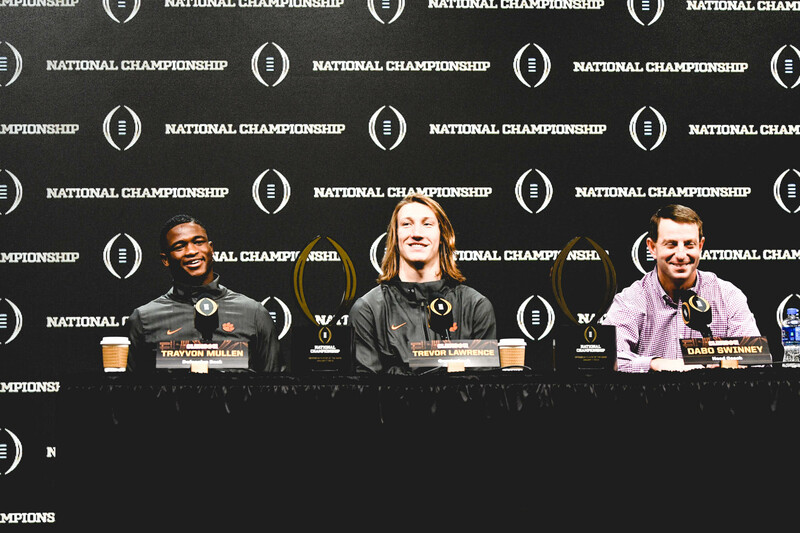 TREVOR LAWRENCE: I don’t think I was in a class because I had just enrolled, and I think I had a class at 10:00 on Tuesday-Thursday, so I don’t think I was in class yet. Q. What class would that have been at 10:00? TREVOR LAWRENCE: At 10:00? Intro to Business. I think it was some business class, a one-hour credit. That was my class? Q. Does it feel like 12 months ago? TREVOR LAWRENCE: No, it’s flown by, but also at the same time, it’s been a grind, and we’ve worked really hard to get here. But it’s gone by so fast looking back now. Dabo, when you see what Justin and Trevor did, not just last night but in the other playoff game, as well, how rare is that for freshmen, and what’s the potential for those two guys? DABO SWINNEY: Oh, man, unlimited potential, incredible. It’s incredible. And T; that catch T made was spectacular. The throw, he put it in one spot where only T could go get it, and I think Justin, especially these last several games, his confidence, his development, he is easily one of the most technically advanced players I’ve ever coached at that position. I’ve spent my whole life coaching wideouts, and sometimes you get guys, and they have all the tools, but it’s going to take a little — you’ve just kind of got to put it all together. But from day one, I mean, his physicality, his — he’s a big guy, and his ability to stick a foot in the ground and go another direction is unique, and you saw that last night. But his understanding and knowledge of route running, his technique at his break points, his ability to influence and manipulate the defender, and then he’s just got freaky ball skills. I mean, it’s unbelievable those catches he made last night. We see it all the time in practice. He made a catch in camp that — I mean, he hadn’t even played a game, and he was like on ESPN from one of our scrimmages. Those plays come natural to him. It’s pretty special to see what he was able to do this year as a freshman and how humble he is and how he went about his work and the development of he and T this year, and then as we progressed we were able to get those guys on the field a lot together, and that created — and you put him back there under center, ET at tailback, man, it gave us a lot of options. So I’m excited to know that we got that No. 8 back next year, and T and Trevor. So should be fun. Q. Dabo, when you signed Nolan Turner, I think a lot of people — I think his only other offer was UAB, and a lot of people thought you were just doing a favor to your late buddy. He played a heck of a lot last night and played really well. What can you say about his journey? DABO SWINNEY: Yeah, we get a lot of that. There’s a lot of people that think we just do favors. People create their own stories. That’s why you can’t pay attention to that stuff, man. That’s another reason we’ve been successful is we do things that we believe in. We don’t sign players that we don’t feel like bring great value to our program. We would not have signed Nolan Turner after that first year, it’s just, again, that divine intervention call it. We weren’t recruiting really any DB’s, and we had four guys leave early after that first National Championship game, four DB’s, T.J. Green, Jayron, McKenzie, Travis Blanks, so now we’ve got to go out and find some DB’s, and we were fortunate to get Trayvon. And then I flew down to see him and meet with his mom, and he came in and I went out to Kansas and got Isaiah Simmons, K’Von Wallace, and I went back and I looked at — I had offered Nolan an opportunity to walk on because I knew I wasn’t going to have a scholarship, and when I started looking at all the tape and I went back and I looked at Nolan’s tape, I’m like, what am I missing here, I mean, this guy can play. So I called Buddy Anderson, who’s the head coach at Vestavia and who’s been the head coach there for 50 years, and he’s coached a million players that have gone on and played college ball, and I just wanted to talk — I said, I just want your honest opinion, what’s your thoughts on Nolan, and it was almost like a — I popped a balloon right there, and it was almost like relief for Coach Anderson. He talked about how frustrated he was. He said, this guy is as good as player as I’ve had come through here, and I can’t get anybody to recruit him. Alabama had offered him a preferred walk-on spot, as well, and I said, that’s all I need to hear. That’s it. I took the tape down or pulled it up for Brent to look at. I wanted to see what — didn’t tell him anything about him or didn’t know anything about him. I said, I just want you to watch this kid. And Brent gets fired up, man, this guy can play, he’s a baller, who is he, where is he? I said, that’s all I need to know, and the rest is history. So it was so — again, God worked that out. I mean, that’s just how things worked. So I was able to call KT and Raymond, KT’s dad, and that’s one of the most special moments ever for me, to be able to tell KT that I was going to fly in town the next day and not to tell Nolan. Nolan thought I was coming to the school to offer him a walk-on spot. And I told Nolan early on, I said, I just want you to know, the rhetoric is going to be that we feel sorry for you and we’re only offering you a scholarship because of my relationship with your dad, and that’s going to be the storyline, and you need to get yourself ready for that. I said, but man, you can play. And what I want you to know is you’ve earned this, all right. You just come in and be who you are, put the work in, you’re going to grow and develop into a great football player, and that’s exactly what he’s done. He had a heck of a sophomore year for us, a great sophomore year. There’s no doubt over these next couple years he’ll be an incredibly pivotal player for us. Had a great game last night, did a heck of a job, plays on all the special teams and starts in our dime package. We went to him early in the game last night. We gave up a couple big plays and thought he settled us down a little bit. But really proud of Nolan. Q. Dabo, when you have your first team meeting Friday, you’re going to be missing a few defensive linemen for that, I imagine. How do you feel about the next man up mentality with that group and just the number of reps you were able to get the younger guys to get ready for their bigger role next year? DABO SWINNEY: Oh, man, I’m excited about it. I love that. I can’t wait to have that meeting on Friday. It’s always a fun meeting for me to kind of reset the room, if you will, and kind of paint a picture of what this new journey is going to look like and what we’ve got to do. Every year is a new challenge, and you don’t carry anything over. Trevor has got to go earn the job again. Trayvon has got to go earn the job again. We’ve got a starting point, but he’s got to prove that he’s still the best player. That’s just how it is. You don’t get to carry those touchdowns over, any of that, those good decisions. We start over, and it’s exciting because I know we’ve got a bunch of guys that are going to — we’re going to be a very experienced offense. We’ll have four seniors in that offensive line. We only lost two guys. We’re going to be experienced at running back, experienced at quarterback with Trevor and Chase, experienced at receiver. I think we’ve got a chance to be dynamic at tight end. So I’m excited about that. But defensively we’re going to have pretty good experience there, too, but I think what we’re going to be able to put on the field up front, we’ve got a lot of guys that nobody — y’all don’t have no idea who they are right now, but this time next year everybody is going to know who they are. That’s the fun part about what I do. We get to start over every year and plug guys in and let them go play. So it’s exciting to know that Xavier Thomas has got a chance to be an every down player and K. J. Henry and Mascoll and we’ve got I think five mid-years that just moved into Clemson yesterday that will be in that meeting. So it’s going to be an exciting spring, a lot of fun to pull it all together and get that group ready to go next year. Q. Trevor, when did you first get a real good look at just how good those last two Justin Ross catches were? Were you able to sneak a peek at the Jumbotron or was it after the game when you saw the highlights? And also, what is it like confidence-wise to throw to a guy with that kind of catch radius where you just kind of have to get it in the area code and know he’s going to have a shot? TREVOR LAWRENCE: I saw it first hand. I threw the ball, watched him reach over the guy, grab it, then the other one on the sideline, holding his arm down, bobbled it with one hand, catches it, gets hit going out of bounds. I saw it when I threw it. I was watching ESPN last night after the game and saw the replays probably five or six times. He’s an amazing player. Like Coach Swinney was talking about, we’ve got a lot of guys that do stuff like that, but obviously he’s special. It was awesome. DABO SWINNEY: I didn’t know this until coming over here, but they told me that — I’m not on Twitter and that stuff, but Jerry Rice evidently tweeted out, shout-out to Justin Ross. That’s pretty cool right there. You catch Jerry Rice’s attention, that’s pretty neat for a young guy.